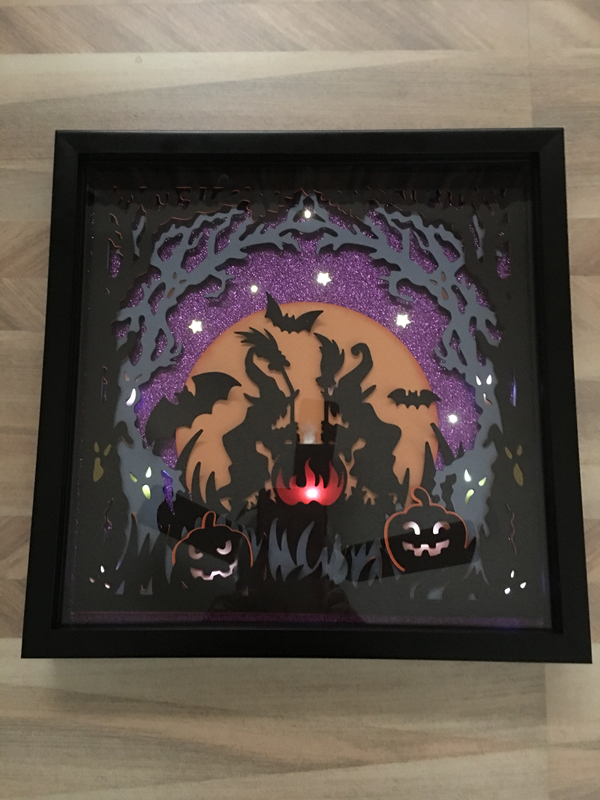 Love this shadow box!! The file is from Dreaming Tree. Wish I could have gotten a better picture - the glare from the glass is creating a problem for me. @Penny, Does it have LED lighting in there? Looks like the cauldron has a light over orange paper and the dark jack-o-lanterns have white light shining through the eyes and mouth. Plus, the stars look like they also have white lights behind them. Yes Gabe - I used battery operated Fairy Lights from Amazon. There are 20 lights on the cord. The lights taped onto the back of the purple glitter cardstock. @Penny - Do the lights blink? That would be very pretty for the stars, for sure. Great job. Thanks for sharing! No these do not blink but I think you can purchase ones that do blink. Thank you. I have made 2 so far - gave them to grandkids. They loved it.